So, here I am again, looking for a good source for frames, and realizing that it might be necessary to find someone again who can make them! In the meantime, though, I want to talk to you about another aspect of the slate frame – trestles. There are few professional embroiderers who don’t agree that the best possible way of achieving tension for hand embroidery – and especially for more complex techniques such as goldwork – is to use a slate frame. In days of yore, the slate frame was widely used, and it was used in a variety of sizes – from small to really quite large. In some books, you can find illustrations of slate frames with more than one person at the frame. In 18th Century Embroidery Techniques (see my review), Gail Marsh shows a massive slate frame supported across the back with a stabilizing bar, on which frame the embroiderer could lay out a large project – like several pattern pieces for a jacket – on one stretched ground fabric. In several of the old books on ecclesiastical embroidery, the guild workplace is shown with large frames on which whole banners, chasubles, etc., are stretched. Large works, indeed! At the beginning of Church Embroidery and Church Vestments (PDF – scroll to page 12), you can see a photo of ladies in the guild room, two of whom are sitting up to one slate frame, working. Today, the slate frame is still used – it is not defunct! Despite the convenience of hoops, of stretcher bar frames, of plastic Q-snaps, and so forth, the slate frame is still employed by serious stitchers. Its revival in popularity is certain to continue growing, as more people take interest in historical needlework, and as the interest in techniques such as goldwork also continues to grow. I’ve used a slate frame. I have a large one, so I don’t use it as often as I would like! I would like a medium-sized slate frame and a small one, but there will be time for that in the future – if I can find a supplier! There is nothing so nice as the perfect tension one can achieve with the slate frame, and the unpuckered, immaculate results when the piece is removed from the frame. It’s wonderful! The most difficult thing I’ve found about a slate frame is how to support the thing. Especially if you are working on a medium or large-sized frame, it is impossible to support the frame with one hand while stitching. At the same time, the slate frame tends to be heavier than other frames (stretcher bars, for example), and so commercial stands cannot support large frames, and cannot always support medium frames – or can “just” support them. Of course, there’s always the two-table set-up, where the frame is rested horizontal, between the edges of two tables. But that has its drawbacks, I assure you! In the past, the slate frame was generally supported by a pair of trestles. Originally, these were saw-horse type trestles, so that the frame rested perfectly horizontal, parallel to the floor, like a table, and the needlework sat up to the frame on a stool, and worked in that manner. Then, trestles began to develop a bit. You can see in the turn of the century book Church Vestments, mentioned above, that the “trestle” is actually an adjustable support, where the frame is placed between the body of the trestle and a top board, which is tightened down on top of it. I’ve seen other set-ups of trestles, specifically some left over from convents that used to make embroidered vestments. These trestles were even a little more complex, and their adjustability allowed for the frame to be supported completely vertically (as is seen on the front of the book, Embroiderers from the Medieval Craftsmen series), at various angles, or flat. While I was considering the whole dilemma of the elusive slate frame and pondering the notion of trestles, it so happened that a friend’s dad volunteered to do some designing and building of a set of trestles – an embroiderer’s workstation, actually, which could accommodate a slate frame (from small to very large), stretcher bars, and even hoops. The concept developed by considering different types of trestle set-ups of the past (especially those found in convents before the 1960’s), and understanding what the embroiderer today would want in a workstation. Last week, the protype trestle workstation arrived. I want to show it to you and ask for your feedback. They arrived in a box custom-made for shipping them. Everything needed was included in the box. The carpenter (Brian) was very meticulous in the packing of the crate and in the assembly of all the pieces of hardware. Those are all the pieces, leaning up against the furniture. It looks complicated, but every piece went right together as the instructions indicated. It took me less than twenty minutes to put the whole workstation together for the first time. These are the main pieces, though the leg braces are not attached yet. This is a shelf support. This is the whole set-up, almost completely extended. On the sides, you can see that there are, front and back, adjustable vertical bars. Into those vertical bars are placed the supports for the dowels, which in turn support the frame. The dowel supports can be angled a variety of ways. I’ll show this in more detail later, after I have played with the set-up a bit more. 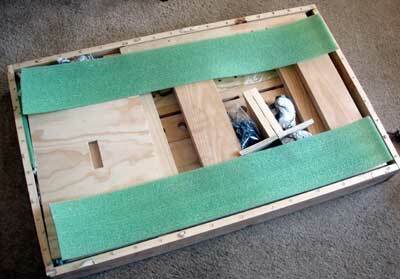 Here’s the set-up with a stretcher bar frame resting on it. The trestles have been moved closer together than they are in the previous photo. This is an attached table, and the workstation actually has a variety of options for attached supply tables, clamped lighting and magnification, etc. So here is the initial introduction to the trestle workstation. I’ll be taking more detailed pictures of it this weekend, in “action.” I’ve since moved it out to my studio, where I will be able to work better with it. I have a very small living room (smaller, I think, than most people’s closets…) so the workstation tends to look larger than it is in the photos above (I’ll measure it for an accurate “footprint”). 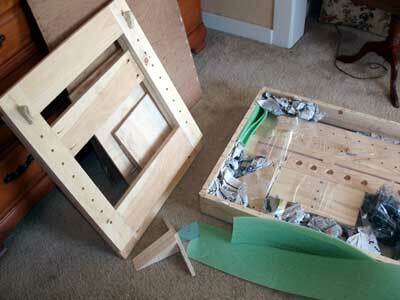 When the dowels are removed, the two trestles can nest together to conserve space. What I’ve learned about it so far: it is sturdy. It’s like sitting down to a piece of furniture. This is the real thing! It goes together very easily. In concept and design, it makes good sense. There’s a myriad of possibilities for extension and accesorization, but more on that later. Brian, you are a wood-working wonder! Thank you! Now, dear readers, do you have any thoughts on this? Do you see any glitches right off the bat? Does it raise any questions in your mind? Do you have any ideas that you think would make sense concerning the workstation? I would really appreciate your input on this! You are, after all, embroiderers. You know what you would like, or what you think would make sense, in this type of equipment. How can this become the ultimate embroiderer’s workstation? I’ll be sharing more details on this as I work with it, and let you know more detailed discoveries. Thanks for taking the time to read and to respond, if you want! I love it! Just a thought… it might be nice to have the little table have low edges (sort of like a tray) so that small items don’t get knocked off. I think it’s great! A really sturdy piece of furniture to support a trestle frame – at adjustable sizes. Oooh! I want one! I want one! And is it height adjustable, too, as well as angle-able? Hi, Laura – Yes, the “edge” on the table is an excellent idea. Hi, Claire – Yes, it is height adjustable. You can adjust it to a relatively “low” position, perfect for sitting, even for a small person. For a taller person, you can move it up a notch or two to sit at, or, if you want to stand, or use a taller stool, you can adjust it higher. Keep the questions and suggestions coming!! My first thought is to always use a chair on wheels to stitch with this. I am constantly interrupted as I stitch so I’d be moving the chair back to get out quite frequently. You probably will want to see the Evertite trestle stand that Evan Burroughs can make to order. It’s on Blog (address below). Evan loaned me pictures. I forwarded a link to your article to him so he knows you are hunting for him. Hi, Megan – It is great. The knobs and hardware for adjustments are all very easy to use, too… I forgot to mention that! Would still be interested in purchasing plans since Brian never got this into production. Did you mean “which in turn supports the slate frame”? Otherwise, I’m having a little trouble figuring out what supports the work. This is a beautiful piece of work. It’s similar to the stand I have for my hammered dulcimer, which I love for its sturdiness and portability. The only suggestion I have is that the support feet might be better made round or oval rather than angled. I’m constantly stubbing my toes on “things with corners”. I can also see where this might be quite expensive, especially made from a more exotic wood than pine. That said, I’d be willing to shell out some serious cash for one made in burled oak and tiger maple, because in my home it -would- be a piece of furniture. Many kudos to Brian, who seems to have understood perfectly what’s needed. Whoops! Thanks Katy! Everyone needs a proofreader! You’re right – I’ll correct it right now! Yes, the wood and the expense need to be taken into consideration! Thanks for the link to the stand that Evan made. A long while ago, we had communicated about trestles, but nothing ever came of it. He said he was designing something, but then we fell out of contact. Regarding the chair, yes, out in my studio (wood floor) I have a rolling chair! I am constantly up and down and in and out when I work out there, so a rolling chair is great – esp. 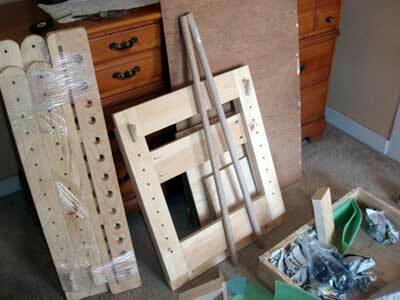 moving from drafting table to cutting board, to embroidery frame, etc! The proper way to get up from a slate frame on trestles is to lift the slate frame, walk out through the trestles, and then turn around and replace the slate frame on the trestles now behind you. This is how they teach at the RSN. Mary – question #2. Looking at the pictures again, how does the frame attach to the dowels? Do you clamp it or does it just rest on the dowels? Wouldn’t a heavy frame tend to roll off, especially if it’s at a fairly accute angle? And as for do-dahs, I’d add a small cloth bag hanging from the shelf edge. Good for thread ends and other bits of fluff. Let’s all pretend it’ll stay off the floor! That is very impressive. Not being experienced with large frames, my only ‘brainstorm’ is to have a little flat wooden arm that would swing out from one side or the other, with hooks on it. Then you could hang your scissors, floss organizers, etc. from it. It would lie flat against the side unless you swung it out to face you. I hope this makes sense. I suppose there could be another similar arm that would swing out to hold charts, papers, etc. on a clip or rack. By the way, I came across a seller on Etsy who makes her own sit-on frame holders, the kind you sit on in a chair- rhondasstitches. They’re more affordable than anything else I saw, but I haven’t seen one in person. She or someone else who does woodwork on Etsy would probably be up for a custom order or a challenge. I’m rather addicted to your blog, by the way. It’s inspiring me no end. The scanned books you gave a link to helped me design the cut-work/needlelace pillowcases I’m working on, and I’m also inspired to try some crewel. Thanks for your amazing videos! Hi, Goldberry – I’m glad to hear you’re addicted! 😉 As for frame holders, hooks, and such items – good ideas. There’s a lot of room for accessorizing here, so that, too, is something I’ll be playing with. It looks like a fantastic idea. I can see how it would be useful for larger pieces and easily being able to pick up the work, turn it around and secure it again and continue working at an easily reachable manner so you are not stretching out too far. I think a beneficial reason of why medieval frames started flat is so that multiple people can work at the same time. I have seen a video of a chinese silk embroiderer at work with a long length of silk stretched and two people either side of the piece working on the emberoidered design. It is hard to say whether you will find any problems at the moment. My thought is that the table extending that far to the inside might be a problem for reaching the embroidery there, banging a knee… but it looks like you could extend the frame wider if needed. Maybe a cantilevered table would be better than one with the hole through the middle though? It’s Lent and its a sin to covet, regardless. But I would compound that sin by lying if I stated that I did not want one! I plan to live vicariously so please post a LOT of pics. 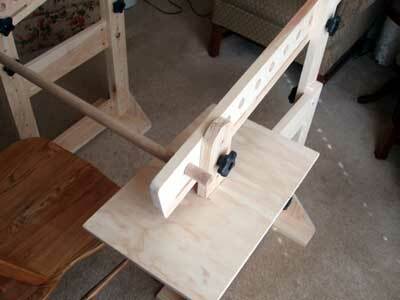 This is not unlike the Japanese Embroidery frame stand made by Denise Tremblay (in Canada). Her design is simpler, however this stand looks like it would handle pieces that are larger in the vertical direction. Very nice. Perhaps if the side bars/mid bars on the trestle were a little higher this would allow the user the option to sit at the side of the frame to work (for those of us with so little spatial awareness that we don’t much like working on our motifs “upside-down” so to speak….:). And also allow two people to work on it. But only the carpenter would know whether that would wreck the balance of the whole set-up. However, if my Dad weren’t in another country, I would be pushing these pictures under his nose (son not really up to making something as good as this – but might also have it shoved under his nose as mild reproach….). Mary: Could you please explain the term “Slate Frame” – I keep seeing a frame made of slate in my mind, and I Know that is not correct. The closest meaning I found that made sense was a frame for an old school slate, with the slate removed. I like the entire piece. It looks like it’s beautifully made, it’s attractive, and it looks user friendly. I like the reader’s comments about using a chair with rollers. For my purposes, however, I would like the actual frame to be on casters or rollers. I would also like the frame to fit a normal-size easy chair. I don’t sit in a kitchen chair in the evenings – I sit and stitch in a living room chair such as that shown in your photo. Being able to get up quickly to answer the phone or help an elderly relative is important to me. Moving that huge frame away from my chair might present a problem; and I think having the actual frame on rollers might solve that dilemma. Having a little tray or some kind of set up for stitching doodads would also be great, and I noticed several readers commented about that as well. It’s a beautifully designed piece though, and it looks well thought out. Great job! Some good ideas here – thanks, all! For the stretch on reaching the middle of the piece, you are right – it would be a stretch. That’s the nice thing about slate frames, that you can roll the work on the top bar if necessary, though that doesn’t really work with large pieces of goldwork… But, in any case, yes, I’ll demonstrate. The difficulty of the stretch is somewhat allayed with the vertical position of the frame. The trestles can certainly be moved further apart and can accommodate a frame as wide as the dowels can handle – in fact, the dowels can be longer, to accommodate wider frames, and two people can sit up to the frame easily, one on each side. The term “slate frame” has been around for hundreds of years; there are several theories on why it is called a slate frame, though no one has pinned down the exact etymology to my knowledge. But the end of it all is the fact that it is called a slate frame. That’s what it’s always been called, and so that’s what it is. I promise (cross my heart!) I’m not calling it something other than what it is, or making up a name, or misspelling the name (from “slat” to “slate”). The best sources for information on the origins of the slate frame and its uses would be any book on historical needlework, needlework of the late medieval era and beyond, etc. I think it would be difficult to have the entire set-up on rollers, unless the wheels had a locking mechanism. And that would counteract the point of having it on rollers because they would have to be unlocked to move it. It’s not really a set-up that works well with a living room chair, though I’ll verify that further as I work with it. I’ve found so far that an office-type wheeled chair works well with it, as does a regular dining room chair, a piano-type bench or stool, etc. Thank you again for all your input – I’ll certainly demonstrate and discuss the details with better pictures and so forth as I play with the trestles! When I began goldwork, I searched for trestle or trestle-like stands to hold my frames. I corresponded with Tonie Evans, a high-level Japanese embroiderer and teacher, about what she used. Given that I live in one room, I just have to content myself with the wonderful floor stand you introduced me to. For the small works I do, stretcher bars and that stand work just fine. But I can see what a magnificent appliance your custom-made trestle stand is. I’m looking forward to the next installment on your use of it. Lovely! Is the Needlework System 4 (your preferred floor stand) not up to the weight of holding large slate frames? Do you have an estimate of how much weight it can handle? needleartworks.com is advertising slate frames from Tristan Brooks here: http://www.needleartworks.com/dsgnr/tbd/tbd9.htm I haven’t tried to order from them, so I don’t know if they are actually delivering them right now or not. Might be worth a shot if you’re looking for one currently. It looks like just what im looking for I don’t suppose there is any where to purchase them from. Not yet, Caroline – I’ve been working with the protype for a couple weeks now, and really enjoying it, but Brian is planning to make a few changes, so we shall see where that leads! 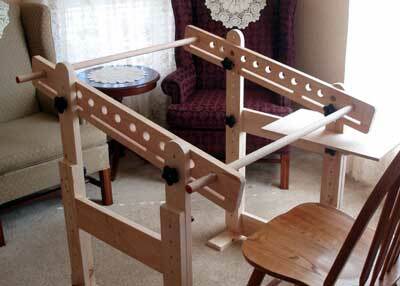 I am curious if there has been any movement forward on perfecting and making the needlework station available? This is sooo cool! I typically like to do very large projects and holding the frame is cumbersome and tiresome. I would love, love, love to have something like this! If it ever gets going again, I'll definitely let you know! I have just found your website with the embroidery trestle Brian made for you in 2009. Has it worked out for you? Is it possible to purchase one??? I’m going nuts trying to hold up a large slate frame or trying to work with it balanced between two tables. Hi, Jan – Well, I have the prototype that you see in the blog post, but the construction of a finished set never actually came true. It was one of those cases of life getting in the way for Brian, I think! it’s great having the prototype, I have to admit! I use it often out in the garage (workroom! 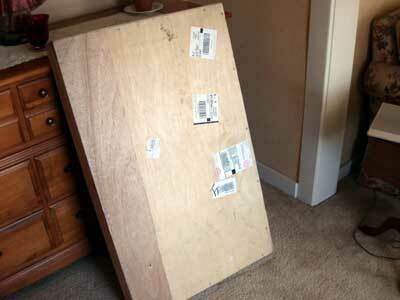 ), but it’s too big and bulky for in the house. Sorry I can’t help you further on this one! Hi, Elaine! Well, great minds think alike. I’ve been talking with a friend about this very question lately. I’d like a simple set of trestles, too – so I’m thinking of solutions! I expect I’ll revisit this subject in the near-ish future, as a solution unfolds…. You might like to check out the Traditional Frame on elitesilkarts.com. It is the traditional slate frame system used in China for needle painting embroideries. If you click on “Embroidery Procedures”, you will get the supplies link. Click on the trestle picture and you will get more info. It is $45.00. I have purchased one of their needle painting kit and am pleased with it, especially the detail embroidery instructions included with it. I was just browsing the IKEA website, when I ran across the VIKA ARTHUR http://www.ikea.com/us/en/catalog/products/00144763/. Looks like that could be an idea for threshles for supporting a large slate frame. Only thing is, I am unsure of how much legspace two of those will give you. But it is adjustable in height and angle. Hi I have just seen on line the trestles and slate frames for sale at the Royal School of Needlework in the UK. The trestles are #425 sterling and the frames between #73 – #79 sterling. Mace and Nairn also in the UK have the frames. I live in NZ and am currently trying to find some closer. Sold! I love it! I especially love the flexibility to use more than one sort of frame. It would be nice to have the small worktable on the left for me as I am lefthanded, or to have the option of ordering it that way. I like that the little worktable looks plenty big enough for a velvet pad to keep goldwork pieces from running off. I think I like the idea of having it unfinished – I may prefer to paint it rather than have it varnished. This looks like a great improvement over the trestles which were available through the RSC. Kudos to Brian, and please ask him where and when I may submit my order? Hi Mary, I have been looking for a good set of trestles for slate frames. I read your articles about the set designed and made by Brian, and they look fabulous. Does he still make them, and also what do your recommend today, 5 years later? Many thanks for a wonderful daily “fix”. I do so enjoy your comments, tips and suggestions. Hi, LeslieAnn – I’m afraid he doesn’t make them. These were just a test, and it never went further, unfortunately. I still use these all the time. But you can contact Lucy Barter (the RSN coordinator in San Francisco) – they have regular trestles you can order. Glad you enjoy your daily Needle ‘n Thread “fix”! Looking at your trestles that you had made, they look excellent as you can adjust the height so it slopes down nearer to where you sit. The trestles from the Royal School of needlework do not seem to be so flexible in this aspect and in addition they are £425 plus postage (admittedly only £10 in the UK) but that all comes out to around US$650. Even with high postage to the UK I am sure your trestles would be cheaper and probably a lot better too. I don’t know if you can find out if you can ship them to the UK but certainly I would be interested in a set. I have been looking at large slate frames too. There are really lots of variations, l looked at hand looms a lot, since the ergonomics have pretty much been dealt with there. Also looked at large tamber studios like Lesage, where they have full time staff working on tables like these. The one thing I notice people battle with is where to put your arm if you have to work on the furthest section, or are working for a long period and your arm gets tired. Also keeping your work clean. I would like to be able to place a piece of wood across the top of the piece of work that can support my arm. 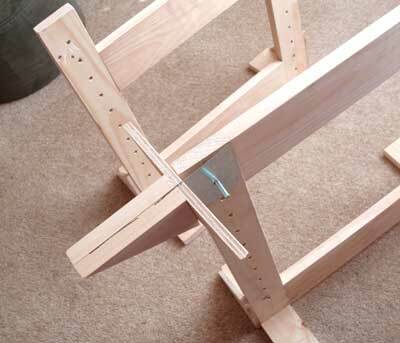 If you look at the top of the table, where the poles supporting the slate, if this had a piece of wood parallel to the work that you could put pegs in to support a piece of wood across the work, it could be helpful. Other than that, a extra raiser bar to clip your light to would be nice. Using hard wood would cost more but would allow you to reduce the size of the support beams , making them easier to reach around. 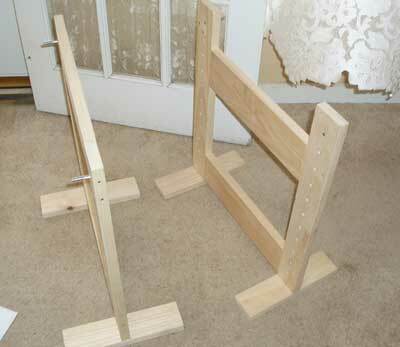 It looks like the perfect stand because its adjustable to different size pieces for cross stitching! Happy stitching with it ! 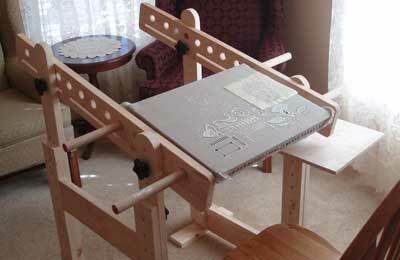 I read your article “Trestles for Slate Frames Used in Hand Embroidery”, with interest! Just what I’m looking for!! I’ll be taking more detailed pictures of it this weekend, in “action.” and (I’ll measure it for an accurate “footprint”). Did you do that and, if so, did you post these data in a follow-up blog?? If you did, please provide me with the reference so that I can peruse! We understand the trestles more clearly now as a result of this second article. Wondering, do you have any measurements of the trestle sides and slider arms and/or footprint for your prototype?? Hi, Lubi – I didn’t measure them, I’m afraid, and right now, they’re put away. But they’re about 36-40″ deep, and then width varies, depending on how far you space them. Hope that helps! Not to worry! However, if you get the time and can measure them and let me know, I’d be very grateful! What ever happened to this? I would love to purchase one. THANK FOR THE INFORMATION ON THE EMBRODIERY IT WAS VERY INTERESTING TO READ ABOUT THE HISTORY AND THE WAY THEY WORKED. AS FOR YOUR NEW STAND, LOOKS GREAT ONLY PROBLEM FOR ME IS I JUST CAN’T SEEM TO WORK WITH THAT KIND OF STAND. I HAVE ALWAYS WORKED WITH A HOOP AND IT SEEMS TO WORK FOR ME. SO WHAT I MIGHT DO IS WHEN I HAVE SOME EXTRA CASH IS GET A STAND FOR HOOPS AND WORK IT LIKE THAT. This looks like the perfect frame for my embroidary projects and I would love to try tambour with it. I like the set up and can picture myself spend hours making beautiful art. I have been looking for an embroidery floor stand and this stand looks perfect for my needs. Have you heard from Evan Burroughs? Did he give you any instructions that include the dimensions? There are stands on the market but this one has everything. Update on Evan Burroughs and the embroidery frame availability? Where can I find a trestle for a slate frame ? Hi, Susan – if you’re in the US, try contacting the San Francisco School of Needlework & Design. Lucy Barter, specifically. I think she takes orders for them. Not trestle, but an EXCELLENT needlework stand made by Ocean Woodworks in Coos Bay, OR. This looks amazing. Does your carpenter sell these or the diagrams For this? what are the dimensions for a stand? Looks amazing esp. as its a protype. Great job Brian! I’ve been looking around for that set up but anything close is beyond my budget. I was actually considering making one myself! Is he taking orders?! I would only suggest an option of an extra vertical pole than can be screwed in or clamped on, along legs on either side for clamping on a lamp &/or magnifyer the size of a tablet for those of us whose eyes aren’t that young anymore, But I’m very impressed with it!